A wooden spoon, also known as the "anti-slam" [...] is said to be won by the player who is defeated in the first round by a player who is defeated in the second round, and so forth, until the final of a given tournament. In other words, the "biggest loser" of a tournament is awarded the wooden spoon / anti-slam. For example, Federer lost to Kyrgios, who lost to Isner, who lost to Berdych, who lost to Nadal, who lost to Murray in Madrid. So he gets the wooden spoon for this tournament. Djokovic (0): None so far. Haha, Nice! I always go back down a draw to see who was the biggest loser in a tournament. I did not know that there was a Wooden Spoon though! Thanks for the info. Interesting stat. Do you have any more for other players? I have to sift through the results manually. I start by looking at all first round losses by a player and go from there. For example, Murray. Madrid is not a true wooden spoon as Fed had a bye in R1 and the count starts from R2. A true wooden spoon is when it starts from R1. Or it's even bigger loss considering he is a seeded player with favorable draw. So this thread did exist. I'm actually surprised it's as many as 3 for Nadal & Fed, as the Wooden Spoons are a tiny subset of the matches lost upon entering a tournament, which itself must be very small. Also, notice Hrbatý accounts for 2 of the 6 WS! Yes. He got the wooden spoon, no question about it. In Wimbledon 2013? No, retirement and defeat have the same draw consequences. But Łukasz Kubot would have had to lose in 3R to Paire, then Paire lose to Mannarino in 4R, then Mannarino to Janowicz in QF. 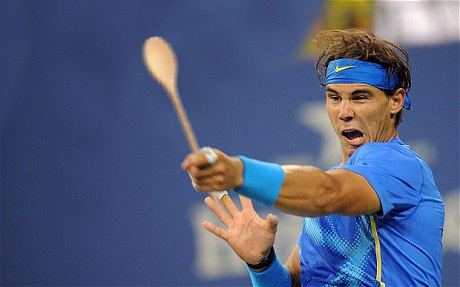 None of this happened, so Nadal was far from earning Berlocq's wooden spoon. So Dimitrov doesn't even have an Anti-Slam? I'll do the Slams in my spare time to see who the biggest loser was. Btw I'm not sure f.e. 2015 Madrid should count because Kyrgios won a match before beating Federer. 2012 Wimbledon - Bogomolov Jr.
Wow, so wooden spoons for BOTH Fed and Rafa this year! I meant the GS wooden spoon lists already exist, all the way back to 1969, and I posted the links over there. The threads are a little different. This one is about the number of wooden spoons across all events, the other one about slams. We could merge but I don't know how to proceed. Better yet: before January 2015, Dominic Hrbaty accounted for 50% of all wooden spoons handed to them (1 each). Have any men ever "achieved" this? Marat Safin 2004 US Open wooden spoon. Won 2000 US Open and 2005 Aus Open. Also find this funny. Fernando Gonzalez was a finalist at the the 2007 Australian Open. Yet was the wooden spoon winner at the 2007 French Open AND the 2007 US Open. Not only was it 2 but in the same year and the same year he reached a slam final. I especially like Krajicek and Safin's efforts, winning both the title and wooden spoon at one particular slam. Good list. But since we're talking about Anti-Slams, Nadal now has 1 and the others have 0 at the moment. We need a photoshop of Rafa biting his "trophy" following last night's historic win. Spoon defenses? Imagine they come along once in a blue spoon? Fed has an opportunity here. Well, pseudo-Spoon, anyway. So Rafa is better at 'spooning' than anybody else? So Fed has both the slam and wooden spoon at the REAL SLAM ? Lol Hrabty, making the spoon possible for Fred when he's #1. Hrabty underrated sneaky *******. 4 of his 31 top 10 victories where against the world #1.